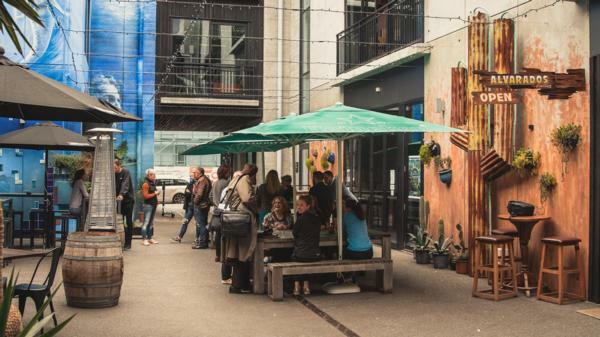 Offering an eclectic mix of night life, bustling laneways, innovative businesses, great events and outstanding hospitality, Lichfield Courtyard, near the corner of Lichfield and Madras streets, is a good example of businesses working collaboratively together to proactively activate a central city precinct. Property investor for Lichfield Courtyard and a number of other properties in the Innovation Precinct Patrick Fontein said it was important to celebrate the past while embracing the future. "We wanted to continue the original context of the Lichfield lanes, like Poplar Lane, to reintroduce the grittiness that was there before the earthquakes," Fontein said. "We got pretty radical with the design inside the courtyard, and the tenancies there have continued that theme. It is a mix of traditional spots that have been around for generations and new innovative restaurants." Fontein said the area featured outstanding hospitality from authentic Mexican to an upmarket steakhouse, the best coffee in town and kiwi subs with an Icelandic feel. The key businesses are Black & White Coffee Cartel, Jaba grill & bar, Alvarados, The Kiwi Viking subs and shared working space Bizdojo. The area played host to the Urology Associates Movember Car Park Cannon Ball on Saturday which was held in the SALT District Car Park next door and Lichfield Courtyard’s first public event is Osmosis, a music event with 15 artists that kicks off at 10pm on Saturday. Media and events consultant John McKenzie from enthuse media & events has worked with Fontein, his business partner Paul Naylor and the Courtyard businesses to develop a brand and events strategy to build a strong central city destinational profile for the area. "It's a unique combination of a group of businesses coming together to build a destination and a hospitality village within the city, that will ultimately add value to the city," McKenzie said. McKenzie said a clear and consistent proposition about being ‘our place’ will be articulated to city residents, visitors and business about Lichfield Courtyard’s potential and the opportunities on offer.